The UMass Soil Testing Lab tests commercial greenhouse "soil" samples using the saturated paste extraction method. 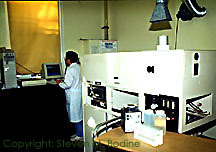 The same basic method is used by many universities and most commercial labs operated by major greenhouse fertilizer and soil mix manufacturers. Please use the nutrient values on this fact sheet to interpret the results of your soil test(s) analyzed by this method at our lab. The normal range for each nutrient tested is shown in the accompanying table. These nutrient levels are for most growth media commonly used for containerized greenhouse crops in Massachusetts. The written comments on your soil test report form are based on these values. Values below normal indicate the potential for a nutrient deficiency. Values above normal may reflect too muchfertilizer which could lead to reduced crop quality and postharvest longevity, injury from soluble salts, and pollution of water sources. Ammonium. Some ammonium in the fertilizer program is beneficial, but ammonium and urea should never exceed 50% of the total N supplied. Excess ammonium can cause injury to most greenhouse crops and the occurrence of injury is highest in soilless growth media. Calcium and magnesium. In general the major source of calcium (Ca) and magnesium (Mg) is limestone, therefore low pH is often accompanied by low Ca and Mg. Most commercial water-soluble fertilizers supply no Ca and very little Mg. If the soil test indicates low Ca, levels can be increased by alternating application of calcium nitrate and the usual N fertilizer. If Mg is low, apply a solution of Epsom salts every 2 to 3 weeks. This solution is prepared by dissolving 2 to 3 lbs. of Epsom salts in 100 gal. of water. Chronic Ca and Mg deficiencies can be solved by using a fertilizer program such as EXCEL. A common problem diagnosed by soil testing is excess soluble salts. Generally this is a result of too much fertilizer in relation to the plant's needs, but inadequate watering and leaching, or poor drainage, are other causes. Sometimes high soluble salts levels occur when root function is impaired by disease or physical damage. Always check the condition of the root system when sampling soil for testing. The accompanying table shows the "normal range" of soluble salts levels for common greenhouse crops. Seedlings, young transplants, and plants growing in media containing 20% or more field soil are less tolerant of excess soluble salts. Soluble salts above the normal range for prolonged periods may cause root injury, leaf chlorosis, marginal burn, and sometimes, wilting. Soluble salts below the normal range may indicate the need for increased fertilization. zThe critical factors for indoor plants are light level and growth rate. For example, rapidly growing plants and under high light can tolerate higher levels of soluble salts than slow-growing plants under low light. Most greenhouse crops can grow satisfactorily over a fairly wide pH range. However, optimum pH values have been established for soilless media and media with 20% or more field soil. Optimum pH values are shown in the accompanying table. The difference in optimum pH between the two types of growing media is related to pH effects on nutrient availability in each. Low pH (values below the optimum range) is the most common pH problem found in greenhouse growth media in Massachusetts. At low pH, Ca and Mg may be deficient. Low pH is also part of the cause of molybdenum (Mo) deficiency in poinsettia. Other trace elements such as iron and manganese may reach phytotoxic levels when pH is low (<5.8). Excess iron and/or manganese can be toxic to geraniums, New Guinea impatiens, and many bedding plants. Proper liming prior to planting is the best way to avoid low pH problems. As a general recommendation, growers should add no less than 5 lbs. of dolomitic limestone per yd3 of growth medium. Greater amounts (8 to 10 lbs. per yd3) of limestone may be needed depending on the materials used to make the medium, irrigation water pH and alkalinity, and acid forming tendency of the fertilizer in use. Do not add limestone to commercial brands of growth medium. It is much more difficult to raise pH after planting. To raise pH, try irrigating with a limestone suspension. The suspension is made by adding 1 lb. of calcium hydroxide to 100 gal. of water. Make only one treatment and test again for pH. This treatment should be made only if it is recommended by an extension specialist. As a general rule it is not advisable to compare soil test results from one lab to those obtained from another. However, UMass soil test results will be broadly similar to those from other labs using the saturated paste extraction procedure. Ultimately, how the soil test is interpreted is the key to what action you should take based on the soil test! Questions regarding the results and interpretation of commercial greenhouse floriculture soil tests only should be directed to Douglas Cox, UMass Stockbridge School of Agriculture (413)545-5214. Questions regarding soil test services, procedures, and fees should be directed to the, UMass Soil and Plant Tissue Testing Lab, (413) 545-2311.